Zoom is a video conferencing tool that allows instructors and students to connect virtually from a desktop, mobile device, or the classroom. What are Zoom’s System Requirements? Zoom will work with a broadband wired or wireless connection and operating systems from the last 2-3 years. Additionally, you may need a camera, microphone, and speakers to participate in Zoom meetings. Visit the Zoom System Requirements page for PC, Mac, and Linux. How do I Install the Zoom Application Software? If you’ve been sent an invitation or link to join a Zoom meeting and have never used Zoom before, it’s a good idea to test out some features before the meeting starts. Click the invitation link or copy and paste it into a web browser and you will be prompted to download and install the Zoom software. It is a separate program similar to Skype. Even if the meeting has not started yet, you can test your audio and video. Your instructor may invite you to join Zoom in either of two ways. Your instructor may post a Zoom link either in the course navigation menu or elsewhere in the Canvas course site [1-2]. When you click on the link, you will be redirected to a Zoom webpage . If you have not downloaded Zoom, follow the link “download & run Zoom” to begin the installation process. If you have already installed the software, the Zoom application should open automatically. If the Professor has sent you an email, click on the link and the Zoom session will start when the Professor opens it . You can also install the Zoom application software for the first time by clicking this link in advance of your meeting. What Should I Do Before the Meeting Starts? 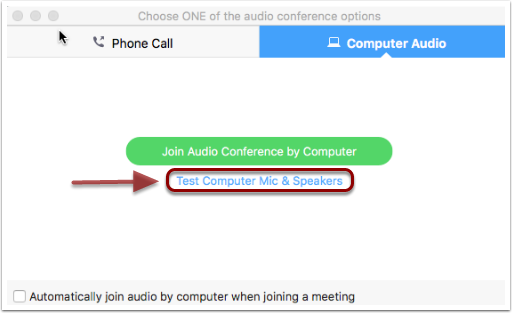 Before the meeting starts, click “Test Computer Mic & Speakers” to test that your video and audio components are working properly. Click on “Video”  and use the drop down menu to select the appropriate camera . The window displays a preview of your camera. If you need more help or information, visit Zoom’s Audio and Video documentation. What Functions are Available During a Meeting? Once Zoom is open, a black toolbar will appear at the bottom of the Zoom window whenever you move the mouse inside the Zoom window. If you see a red slash through your Microphone icon, then click the icon and your Microphone should become available. You should see some green in the Microphone when you speak. For more information, visit the Zoom Audio documentation page. If you see a red slash through your webcam icon, then click the icon and you should see your face appear. If not, then click the small “up-arrow” to the right of the webcam icon and make sure your webcam is selected. If everything seems to be set up correctly, but you still can’t see yourself, then Quit Zoom and restart your computer. If Skype automatically starts up when your computer is restarted, then exit the program manually (if you experience issues with Skype in Windows, visit this brief video tutorial). Open Zoom again and check your webcam. If you are still having problems, then quit Zoom and check if your webcam works with any other programs (like Skype). If your webcam doesn’t work with any programs, then it may need to serviced or replaced by your local tech support staff. Visit Zoom’s Webcam documentation for more information. Once your meeting has started, you can share your screen by clicking the “Share Screen” icon in the toolbar . A new window will display your desktop and any application that is open on your computer. Select the application you want to share . If you are sharing a Youtube video, be sure to click the two checkboxes in the lower left corner . Then click the “Share Screen” button in the lower right corner . While you are in “screen sharing” mode, you will notice a green frame around the app you’ve selected to share . The green frame represents what the other meeting participants will be able to see. Screen sharing options will appear in a menu bar at the top of your screen . For more information, visit Zoom’s Screen Sharing documentation. If you want to learn more about how to use Zoom’s Whiteboard function and annotation tool, visit Zoom’s “How Do I Use Whiteboard?” page. From within the Zoom meeting window, click on “Chat” . Then, use the drop down menu under “more”  to send a private message to the meeting host, or select “Everyone” to send a message to all meeting participants.